have a clock recovery circuit and therefore requires external circuitry to perform the NRZI-encoding. (author's note: buy a flip-flop... problem solved ... ). Steve Robinson, W2FPY of the Ramapo Mountain Amateur Radio Club in Oakland, N.J., described the local progress to date. This included a few completed Vancouver boards, a 220 Mhz repeater for voice and data, plans for a digi-peater and local interest on the verge of explosion. 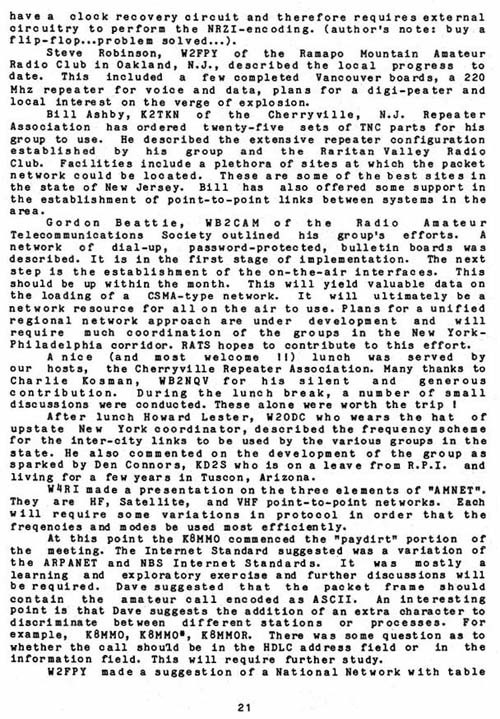 Bill Ashby, K2TKN of the Cherryville, N. J. Repeater Association has ordered twenty-five sets of TNC parts for his group to use. He described the extensive repeater configuration established by his group and the Raritan Valley Radio Club. Facilities include a plethora of sites at which the packet network could be located. These are some of the best sites in the state of New Jersey. Bill has also offered some support in the establishment of point-to-point links between systems in the area. Gordon B e a t t i e , WB2CAM of the Radio Amateur Telecommunications Society outlined his group's efforts. A network of dial-up, password-protected , bulletin boards was described. It is in the first stage of implementation. The next step is the establishment of the on-the-air interfaces. This should be up within the month. This will yield valuable data on the loading of a CSMA-type network. It will ultimately be a network resource for all on the air to use. Plans for a unified regional network approach are under development and will require much coordination of the groups in the New York Philadelphia corridor. RATS hopes to contribute to this effort. A nice (and most welcome ! ! ) lunch was served by our hosts, the Cherryville Repeater Association. Many thanks to Charlie Kosman, WB2NQV for his silent and generous contribution. During the lunch break, a number of small discussions were conducted. These alone were worth the trip ! After lunch Howard Lester, W20DC who wears the hat of upstate New York coordinator, described the frequency scheme for the inter-city links to be used by the various groups in the state. He also commented on the development of the group as sparked by Den Connors, KD2S who is on a leave from R.P.I. and living for a few years in Tuscon, Arizona. W4RI made a presentation on the three elements of "AMNET". They are HF, Satellite, and VHF point-to-point networks. Each will require some variations in protocol in order that the frequencies and modes be used most efficiently. At this point the K8MMO commenced the "paydirt" portion of the meeting. The Internet Standard suggested was a variation of the ARPANET and NBS Internet Standards. It was most1y a learning and exploratory exercise and further discussions will be required. Dave suggested that the packet frame should contain the amateur call encoded as ASCII. An interesting Point is that Dave suggests the addition of an extra character to discriminate between different stations or processes. For example, K8MMO, K8MMO*, K8MMOR. There was some question as to whether the call should be in the HDLC address field or in the information field. This will require further study.